Now available here: https://amzn.to/2wdxMc8 and here: https://amzn.to/2MR1CwEWhat is unschooling? Can Christians unschool? How do you unschool? What is radical unschooling and how does that affect parenting decisions?Packed with genuine, real-world answers to hard questions, this new books answers these and many more questions in a chatty Q&A format with answers from multiple veteran unschoolers. These questions and answers were compiled over the years from real conversations at the Christian Unschooling website and Facebook group and are filled with encouragement for those who feel God may be leading them down a less-traveled path of gentleness and respect for their children’s education and lives. Engagement is a key factor in unschooling well, today I talk about several benefits of engagement and how it works. Please forgive the weird quality. Switched computers and haven't gotten the sound quality I am looking for so gave up and uploaded it so I can get back to working on the CU book. There are a lot of misconceptions about strewing. The goal here is to refocus on what it really is and how it really works so as to avoid frustration and confusion. A bonus snow day episode.Last week was busy. I was super hormonal (and nauseous to boot), moody as all get out, stressed out the wazoo, and had too much to do. Did I mention cranky? And I screwed up with the boys I watch. But they forgave me in the end and when they left (after this was recorded) I even got a hug from the oldest who is NOT a huggy sort. Forgiven.Just a reminder that we parents, no matter how long we have been parenting, no matter how gentle, no matter how much we believe what we are doing - we all screw up. So what do you do to repair the relationships? While I AM working on a strewing post, strewing is not the secret. ;) This post is about respect. Mutual respect and how it changes the family dynamic and is the secret behind unschooling well. A slightly longer explanation of what deschooling is and how to about the process of getting school think out of your (and your family's) life.I apologize for the second half's poor quality- this was the fixed attempt. The first was way worse :). Episode two. What is unschooling? What is radical unschooling? What are are people talking about when they say they are homeschooling? How does all this work? AHHH! In episode two I explain the basic types/classifications of homeschooling and then clarify what unschooling and radical unschooling are versus the most common type of homeschooling- eclectic relaxed.I want to note here that while I adore unschooling it is NOT for everyone. It takes time and patience and willinglness to put aside all the baggage and stuff you are sure your kids need to know and trust them and trust God to give them what they need. It is a huge leap of faith. Not only that but not all family circumstances fit well with unschooling. there are seasons for everything and sometimes public school, private school , cyber school or traditional homeschooling are a better match. I'm Heather Young, owner of the Christian unschooling website and Facebook group and pages. Our group of admins and myself have been talking about unschooling with parents for a long time now and we finally decided to put our answers into podcast form for those who prefer that format. Since I am the only one with a commute- which at least means some down time to record, albeit sans script, it is just me and you, the audience, to start. This episode is a remake of my first attempt (my family complained about the poor quality because I used my phone while driving.) 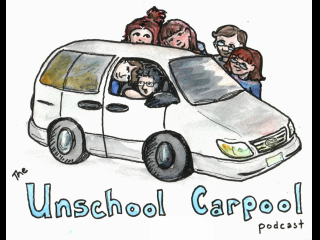 I changed things up a bit, though still talking into my phone while driving because right now it is the only time I have to record.In this episode I talk a bit about our family and how we ended up becoming radical unschoolers when I started out as a teacher in the public school system.